You'll be £11.99 closer to your next £10.00 credit when you purchase Forgotten Tanks and Guns of the 1920s, 1930s, and 1940s. What's this? History forgets. Files are lost and mislaid. But this book seeks to shine a light, offering a collection of cutting edge pieces of historical research detailing some of the most fascinating arms and armament projects from the 1920s to the end of the 1940’s, nearly all of which had previously been lost to history. Included here are records from the UK’s MI10 (the forerunner of GCHQ) which tell the story of the mighty Japanese heavy tanks and their service during the Second World War. 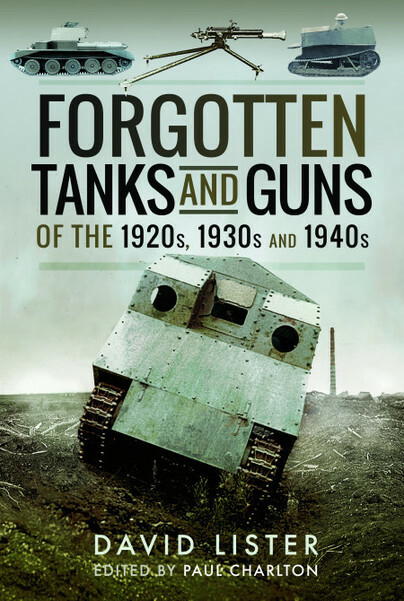 Other chapters expand on the development of British armour, including the story of infantry tanks from the 1920’s right through to the end of the Second World War and beyond. Other items placed beneath the microscope in this fascinating history include a wide variety of guns, rocket launchers, super heavy tanks and countless pieces of specialised armour. Previously overlooked, hidden under layers of dust in archives up and down the country, the histories of these objects has finally been uncovered. This book is invaluable to anyone interested in military vehicle history and contains some excellent black and white photos of the respective vehicles or guns, detailed line drawings and tables of information. Some of the vehicles displayed in the book are recognisable from posts on Army Rumour Service website, notably Martel's one man tank, The Crossley-Martel tankette and the Mechanical Coffin. I would recommend this book to all historians and model makers. Unusually for a compilation, this book makes interesting reading as a cover to cover story as well as a side history to pre and post World War Two. I really like this sort of format and cracked through my copy during a couple of rail commutes into London to do my day job. Mr Lister is an experienced writer who has contributed to a number of publications and websites and to the likes of World of Tanks, which should need no introduction. I really hope he produces more books like this because it has left me with a smile on my face. A 128-page hardback this new book from Pen & Sword and author David Lister makes for some fascinating reading...He has clearly put a lot of work into tracking down much long forgotten information, demonstrating his clear enthusiasm for the topic of armour development. David’s first experience with tanks occurred at the age of 16 when he began work at a local museum. A few years later he started working with computer game developers as a historical consultant. Since then he has worked with several companies including Wargaming’s World of Tanks, Gaijin’s War Thunder, and Obsidian Entertainment's Armoured Warfare. Throughout this time he visited numerous archives across the country and contributed articles to company websites. In 2016 he self published many of these articles in a book called General War Stories. He has also been regularly published in Tankette, the magazine of the Bovington Tank museum.